left to right: left to right: left to right: Mohsen Mahmoudysepehr (PhD student – University of Waterloo), Konstantinos Kapsis (PhD student – Concordia University), Professor Andreas Athienitis (Project Leader – Concordia University), Marie-Pier Plante (MSc student – Université Laval), and Professor Mario Leclerc (Co-Investigator – Université Laval). The use of transparent façades in commercial and high-rise residential buildings has been a common practice in building design during the last two decades, mainly due to an increased appreciation of daylighting. Currently however, facades tend to maximize the incoming daylight rather than controlling it appropriately which could lead to excessive solar gains and therefore increased cooling loads as well as thermal/visual discomfort in perimeter building zones. In most commercial and high-rise residential buildings, where reducing the costs of cooling energy is important, an integrated strategy to control the transmission of solar radiation needs to be adopted. Rather than having reflective, tinted or fritted windows to reduce solar transmission, Semi-Transparent Photovoltaic (STPV) windows may be used to reduce solar heat gains and generate solar electricity, while still provide adequate daylighting and view to the outdoors. 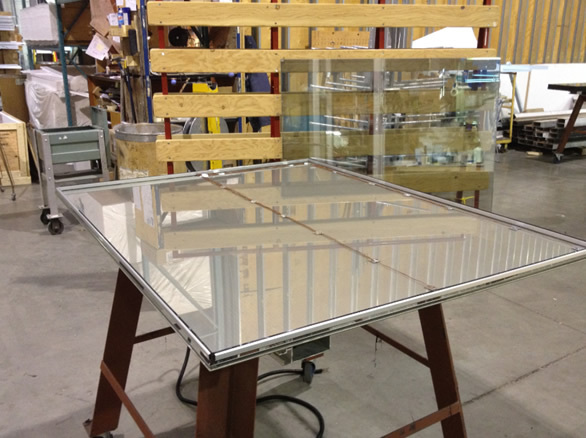 STPV windows can be utilized to cover large skylight and façade surfaces and regulate solar heat gains and daylight. In order for this to be done effectively, and to ensure market acceptance of this technology within the building industry, the solar, optical and thermal properties of STPV windows and their impact on a building energy performance need to be studied and quantified. Issues such as heat management, visual and thermal performance as well as cost and durability have been shown to be as important as solar electricity production. 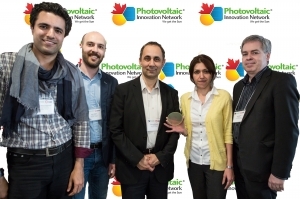 The goal of this project is to study two ways to enhance the cost effectiveness of innovative fenestration designs with STPV: though the development of transparent silicon-based cells that harness as much solar radiation as possible while achieving adequate visible transmittance properties, and through low cost organic PV films with tunable optical properties. An integrated energy model (electricity, heat and daylight) is developed to investigate the potential benefits of STPV windows on the building energy, thermal and daylighting performance, and provide direction to the development of the new designs. 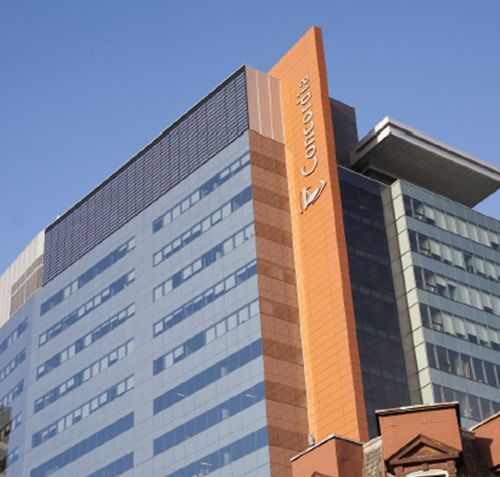 Figure: BIPV has been incorporated into this building at Concordia University, with solar panels blending perfectly into the building’s facade. Figure: A Double-glazed STPV window with built-in sensors completed in collaboration with Unicel. It will be tested it in a custom built solar calorimeter in the solar simulator – environmental chamber facility at Concordia University.